Another rest day, another steep ascent!! All the way from Dingboche at 4350m to Nangkartshang Peak at 5083m, and then down again. I am totally confused when we arrive at the top, out of breath but still breathing… Did the itinerary not state ‘ascent to 4800m’? Sonam is adamant, ‘No, we’re definitely at 5000m and something…’ He probably mentioned the name of the peak at the time, but although my legs seem to function perfectly well in the low-oxygen zone, my brain is unable to keep pace. Thank goodness there are plenty of photographs about on the internet to help me identify the peak in question weeks later. It has taken us just under three hours to reach Nangkartshang Peak, the spot marked by an impressive white flag and an abundance of prayer flags fluttering in the breeze. Plenty of stops for snapshots on the way. Nangkartshang involves some minor scrambling but, apart from the effects of the altitude, is a fairly easy walk up. Nevertheless, the crest is all but deserted when we get there, just a few other trekkers milling around. Where is everyone? Earlier on, nearer Dingboche, the trail was buzzing with other trekkers slowly snailing upwards, huffing and puffing in the thinning air, bearing down hard on their trekking poles. I learn later in the evening that many other trekkers took the ‘rest day’ more literally. ‘We stopped at the half-way rest point and turned back. We were only supposed to climb to 4800m,’ a New Zealand father and daughter trekking duo explained. Others opted for an even more relaxed approach and interpreted the itinerary quite literally: rest (all) day… Five days of relentless hiking at altitude is taking its toll on many. The trek up to Nangkartshang is tough but every bit worth it, so I am pleased to have made it to the top, doggedly putting one foot in front of the other and ignoring any aches and pains. The panoramic views along the trail and from the crest are some of the most impressive in the Khumbu Region. Many of the Himalayas highest peaks, such as Ama Dablam, Kangtega, Nuptse, Lhotse, Makalu and Tabochu are visible in their full glory from the summit. The change in the landscape is pretty dramatic: no more trees, or even large shrubs; just plenty of small compact bushes scattered on a gravelly soil. The path is lined with precariously balanced cairns and littered with jagged rocks. The magnificent mountains tower over crystal-clear fresh-water lakes and deep-cut valleys. After our descend and a quick lunch, I am dead beat and ready for a rest too. I sleep most of the afternoon… Still, on the upside: only minor headache, no knee problems. Things are looking good!! It is bitterly cold when I get up. I dig out my warmer leggings and even wear my windproof jacket to keep warm. Although today is supposed to be an easier trek, and we are only ascending to 4910m (Labuche), I am finding it tough going. Just past the bridge, we enter the Thukla Pass, a large plain dotted with memorial stupas and cairns honouring climbers and sherpas who have died on their quest to reach the summit of Mount Everest, or on their way down. It is a sobering moment to reflect on the dangers and unpredictability of the mountains and the price some pay to realise their dreams: ‘The last word always belongs to the mountain’ (Anatoli Boukreev). Although the solemnity of the place is palpable, the significance of this ‘memorial of the fallen’ is rather lost on me at the time, as Sonam’s English is sadly lacking the necessary vocabulary to explain it to me… Still, the wonders of the internet once again help me out to piece it all together..
A lesser ‘highlight’ of the day greets me when we reach our lodgings for the night. Of course, I had expected things to get less cozy with the increasing altitude since most food, goods, equipment, and whatever is required to sustain human life at the foot of Everest, has to be brought up either by yaks, or people… Porters carry incredible heavy loads to the tea houses and lodges for the comfort of trekkers. But I am not quite prepared for the state of my room and the ‘facilities’… I can manage with the absence of a light bulb at the end of the wires; a head torch and the light on my smart phone take care of that. 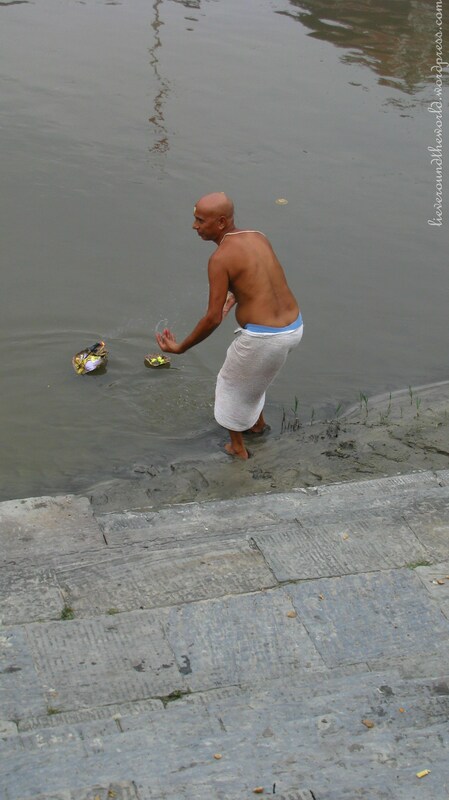 It’s the ablutions that send shivers down my spine, and not just because of the daytime sub-zero temperatures.. On either side of the squat toilet, the floor is slippery with pure sheet ice and obviously someone had to break a thick layer of ice to get to the water for flushing. This is not going to be fun during the night!! This is where the ‘real’ mountaineers would set up their camps in the Spring, just in front of the Khumbu Icefall. In all honesty, the views of and from Everest Base Camp are not that spectacular, or even interesting. The sky is grey and overcast when we arrive at the spot. The real showstoppers are the magnificent panoramic vistas on the way. Maybe a Spring visit, when the real mountaineers prepare for their ascent to the summit and set up their tents, might add a little colour and excitement, but for most of the visitors it is about the achievement, a box to tick. It is for me, in any case. The journey down from Base Camp and back to Gorakshep does not seem as arduous, but after a quick bite to eat, I head for my cozy, warm sleeping bag. Mission accomplished, I deserve a rest! 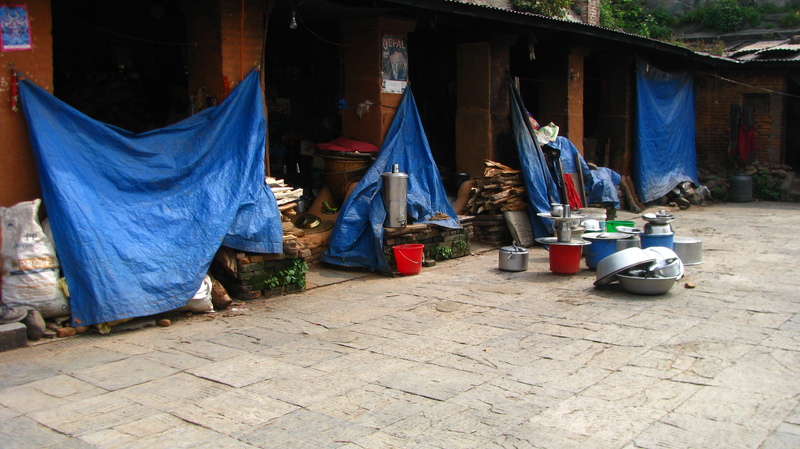 In the evening, I join other trekkers in the dining hall, many of us feeling the worse for wear. The dinner I so exuberantly ordered at lunchtime stares me in the face and, after just one mouthful, I can’t stomach any more. The dreaded lack of appetite. In the end, I take the advice of a Lithuanian man at my table, who is enjoying a luscious looking apple pie as dessert. ‘Forget about nutritional value. Just eat whatever you fancy…’ The cheese topped potatoes are returned to the kitchen and I order the apple pie.. Just dessert sounds good to me!! Conversation at our table revolves around the Mount Everest viewpoint on Kala Patthar where I am heading the next morning. Sunset or sunrise? My itinerary mentions an early rise to revel in the sunrise, whereas the Lithuanian couple preferred their afternoon hike. Both have their pros and cons: sunsets dazzle with colour if the skies are clear but there is more chance of glimpsing Mount Everest in the mornings before the clouds start forming… What I had not reckoned on was the additional four hours trekking to be added to the six hour downhill journey later on in the same day. My itinerary was definitely a little sketchy on that point and Sonam’s explanation certainly did not shed any light on it either. Minor headache tempered with some medication, stomach comforted with apple pie, and using my water bottle as a hot water bottle, I dive into my sleeping bag, fully dressed… Too cold to even consider anything else. As on most days, I hit the sack around 8.00 pm and try to get in a bit of light reading before getting to sleep. Let’s see how I feel in the morning. Sonam has agreed on a not too early start. ‘Let’s leave at 5.30 after breakfast,’ he suggested.. I set my alarm for 5.00 am. I can’t do it. I ignore the alarm piercing the frost in the room and turn over.. Sonam knocks on the door, eager to get going. I groan… My head overflows with an acute desire to move towards lower altitude and a desperate need to wallow a little longer in the soothing womb of my sleeping bag. Mind over matter fails abysmally. I briefly get up, my stomach unsettled, and find Soman in the dining hall. I shake my head, sadly… ‘I can’t do it… I just want to go down. Let’s have breakfast at 8 and aim for Periche… ‘ I get a few more hours of rest and feel so much better for it… Maybe if we had added another day to just walk up to Kala Patthar in the afternoon, I might have managed, but Sonam is keen to get back to Lukla; he has another trek lined up already. A couple of weeks ago, Sonam sent me a photograph of the view I missed; his subsequent charges managed to complete that part of the trek. It is the next best thing to being there myself. But I knew my limits, and there was no point in unnecessary heroics. Plus, I promised my kids to come back in one piece. The descent is so much quicker. Whilst on the way up to Base Camp altitude has to be gained very gradually – no more than 500m a day with acclimatisation days in-between – there is no such worry on our return. We trek back to Lukla in just four days. When we pass the flimsy bridge that looked so unconquerable a few days earlier, I almost waltz across. 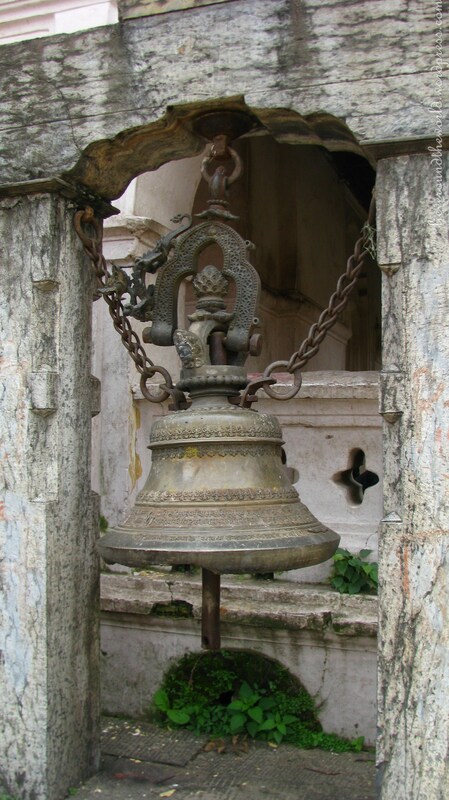 When we reach Tengbouche, my stomach rejoices and I greet the pang of hunger as a dearly missed friend. I am in need of food, proper food, lots of it and I feast on a mouth-watering banquet of humble egg and chips (French fries). And finally data on my phone… I have missed being in contact with my kids and the world, although I am partly to blame for this. Having bought a local SIM card for Nepal on my arrival in Kathmandu, I just assumed that it would cover the Khumbu region and I did not buy the more suitable Wifi card when I had the opportunity early on in the trek. At least I don’t have too far to walk in the early morning as I am booked on the first flight out at 7.00 am, together with the rest of Lukla it seems… The departure hall is packed with passengers hoping for a quick and timely exit. The sky over Lukla looks promising, but rumour has it that not all is clear further ahead and flights are delayed… All that is needed is half an hour of clear and cloudless airspace to get us safely to Kathmandu. Without a control tower in Lukla to guide the aeroplanes, pilots need good visibility to be able to take off and land and navigate between the mountains. This entry was posted in adult gap year, nepal, travel, trekking and tagged everest base camp, Everest Base Camp Trek on December 15, 2018 by lievelee. The message took me by surprise. My second anniversary on WordPress. Two years of writing blog posts, almost weekly… I know I have slacked a little lately. Too busy having experiences, not enough time to keep a record of it all. I have no idea how many words it amounts to or how many pages it would fill in a book; how much of it is interesting and how often visitors actually read the text or just scan through the photographs. But it gives me some idea of how I spent those 24 months, where I went and whom I met; the places I grew to love or hate; the people who stole a small piece of my heart..
How many stamps did I collect in my passport? So far I have visited 11 countries. Not all for the first time, but I stayed for longer periods, immersing myself in different cultures, customs and traditions. Definitely often challenging, but nevertheless the experiences of a life time and I feel I have not even scratched the surface.. Much more to explore on this ever expanding journey, no end yet in sight! But my travels really started, way back in May 2014, with a short trip to Florence, accompanied by one of my dearest friends… It is strange how when life turns upside down you get to know your real friends: the ones who support you when things are tough, those whose ears do not grow tired of hearing the same old lament; the ones who do not point out the flaws in your plan but are ready to help you pick up the pieces. However until I left for India in October 2014, England was my home, the place I returned to after travelling. So if I look back over the last two years to catalogue my ‘travel around the world’ adventures, I have to start with that journey to Florence. No better way to put a smile on my face than a close encounter with David, although we only met in a coffee shop being too stingy to fork out for a visit to the real one. In Cape Town (South Africa) I scaled the Lion’s Head and tackled Table Mountain. I watched the sun rise over Dune 45 in Namibia and spied some of the Big Five on the plains of Etosha. My flight over the Okavanga Delta in Botswana was easily eclipsed by fulfilling a lifetime’s ambition of Grade 5 white water rafting on the mighty Zambezi River, with the roar of the magnificent Victoria Waterfalls in my ears. I stood eye to eye with fierce black rhinos in Zimbabwe. 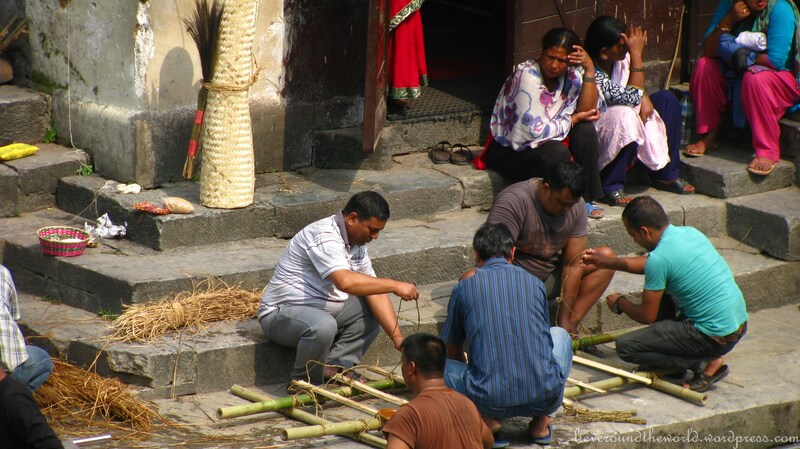 In October 2014, Southern India beckoned… I learnt to navigate the Indian traffic chaos, and became adept at opening a coconut without proper tools. I spent months swaddled in churidars, only to expose my legs near the more tolerant beach towns of Kovalam and Varkala. 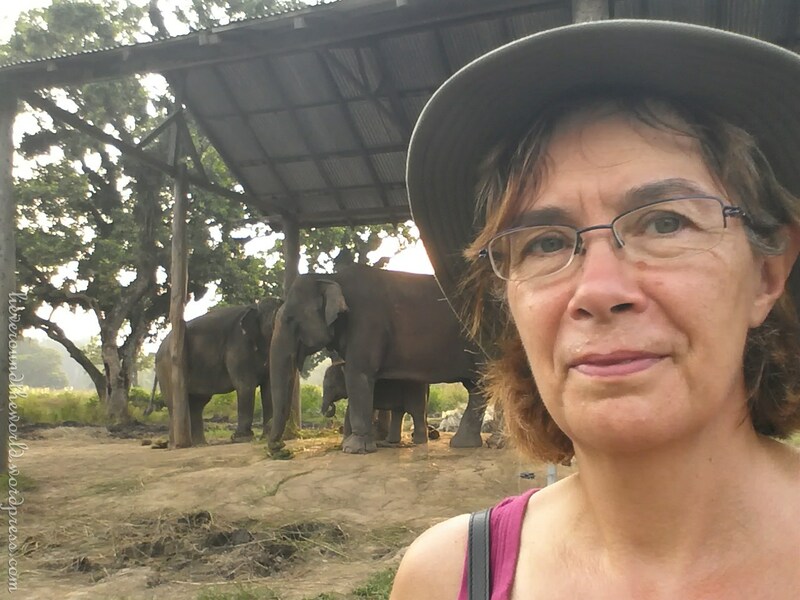 I kayaked the backwaters of Alleppey and bathed elephants in Periyar. I have fond memories of exploring the hidden treasures of Munnar, Kumarakom and Ponmudy with Dr Anne… I watched the sun rise in Kanyakumari, at the southernmost point of the Indian subcontinent and felt my stomach lurch at the sight of men hanging from flesh hooks to appease the gods and earn more desirable opportunities in the future. No more idyllic end to my Indian adventure than spending four days luxuriating on the uninhabited islands of Lakshadweep, definitely one of the best kept secrets of Indian tourism. In August 2016, I escaped the oppressive heat of the Shanghai summer to briefly visit the UK and have a break in Thailand touching the very beaches made famous by James Bond and Leonardo Di Caprio..
Not a bad list of achievements for two years of travelling ‘Round The World’… I wonder what will be in store for the next two years.. Where to next??? This entry was posted in adult gap year, Amsterdam, Annapurna, Bangkok, Beijing, China, Kathmandu, Lakshadweep, nepal, Pashupatinath, Shanghai, solo travel, Thailand, The Great Wall of China, tiger sightings travel, travel on November 2, 2016 by lievelee. 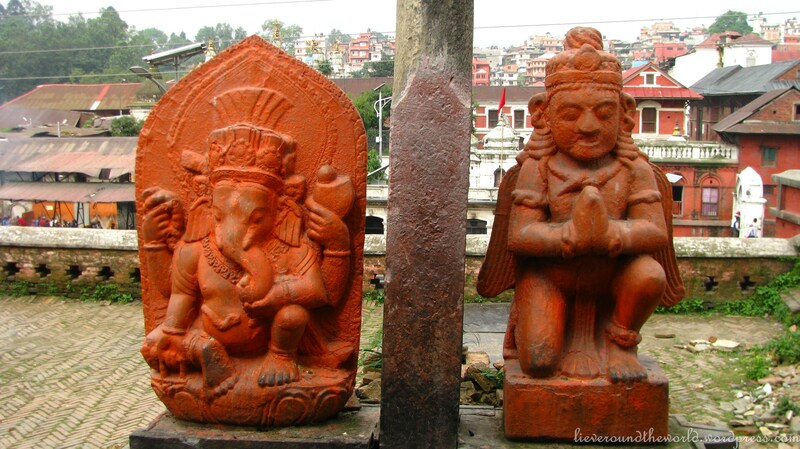 On my first day in Kathmandu, I visited the Garden of Dreams. ‘An absolute must,’ Ashok insisted, ‘if you have the time…’ So after my immersion in Kathmandu and Nepal’s history in the early part of the day, I ventured out in search of the garden AND the pizza parlour opposite, on Ashok’s recommendation. And I did fancy pizza!! Apart from a dismal imitation I bought in a local bakery in N (India) months ago, I had not tasted pizza for ages, certainly not since leaving the UK at the end of May. 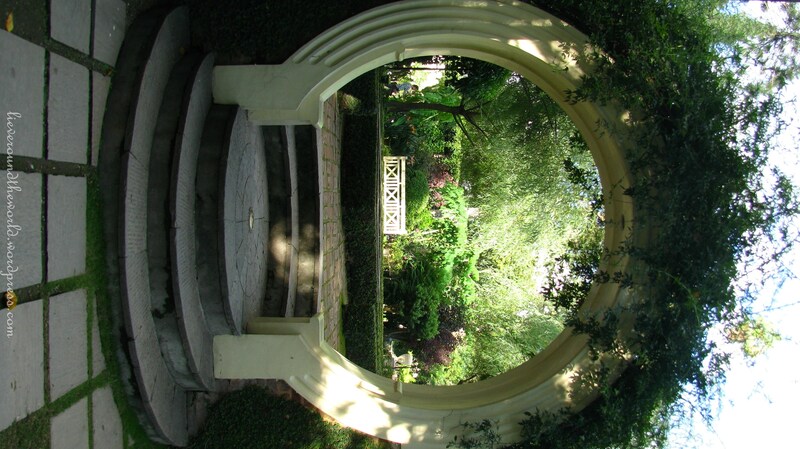 The Garden of Dreams was indeed rather breathtaking: a little gem hidden from the tourist masses and an unexpected oasis of calm and peace in the midst of Kathmandu’s charming chaos. Constrained architecture blended seamlessly with dated buildings, statues and voguish plant-scapes (is this even a real word??? If not, I have coined it now!!!). After the morning’s hectic, Japanese-style sightseeing, I felt the need to rest my feet on a comfortable bench and was joined by ‘Nameless Man From England’. 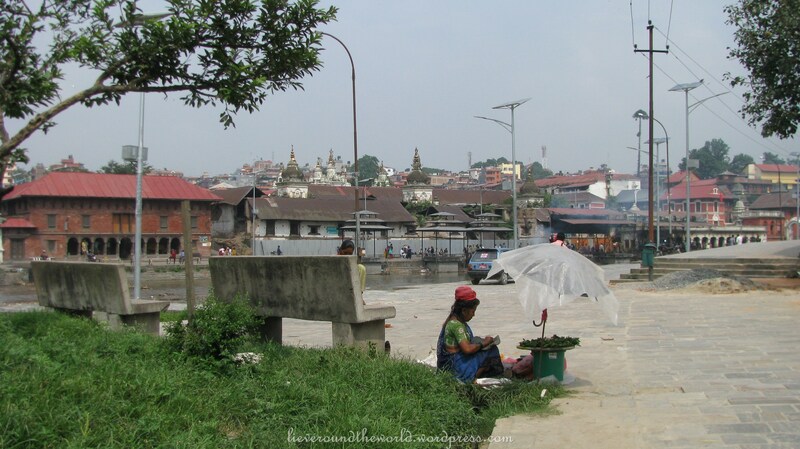 We exchanged Kathmandu experiences and whereas I completed three major tourist attractions in one morning, his approach had been rather more leisurely. 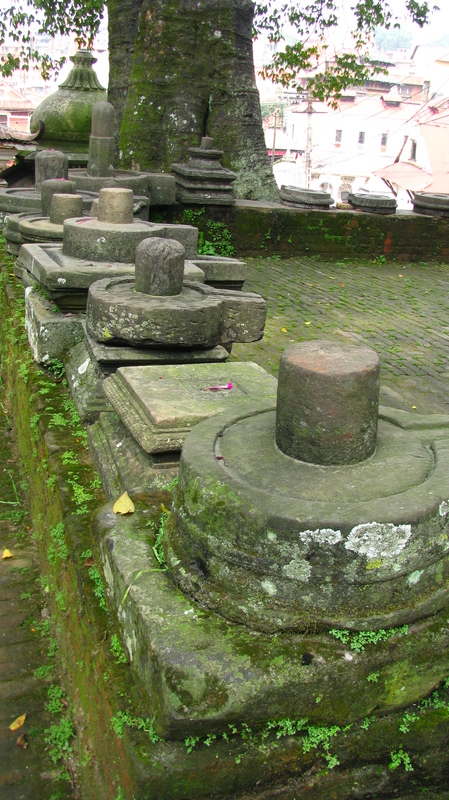 He had already spent a full week in Kathmandu, exploring each and every heritage site unhurriedly, but he admitted, ‘maybe a week was too long,’ and he was ready to check out the rest of Nepal. 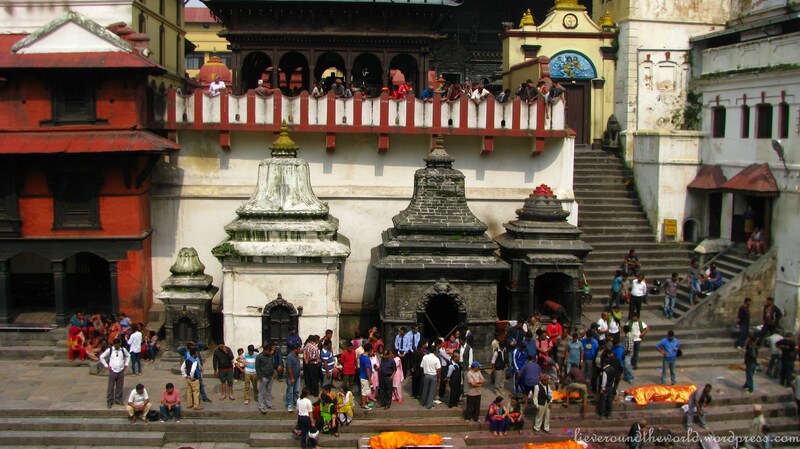 ‘But,’ he continued, ‘ you must visit Pashupatinath, the sacred Hindu cremation place. 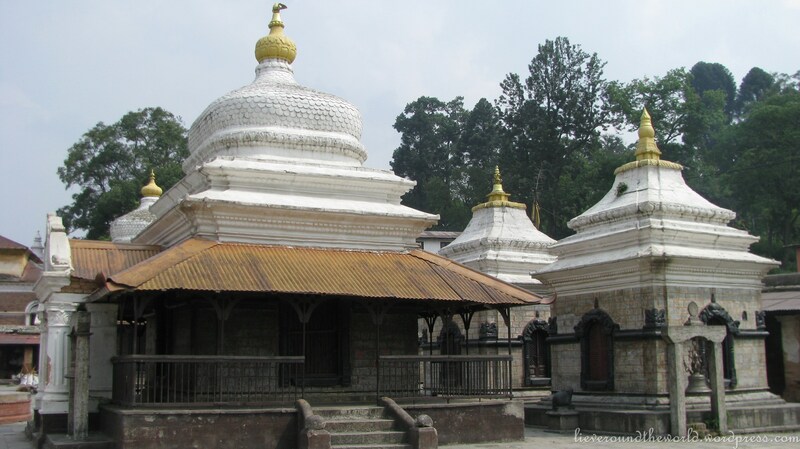 Interesting and very worthwhile.’ I cannot say the idea of cremation immediately grabbed me, but with still a whole day to fill in Kathmandu at the end of my trip, I made a mental note of the name and added it to my list of things left to do. I suppose I could have spent some time shopping, but I promised faithfully not to collect more ‘things’ on my travels which then have to be stored in my son’s garage. 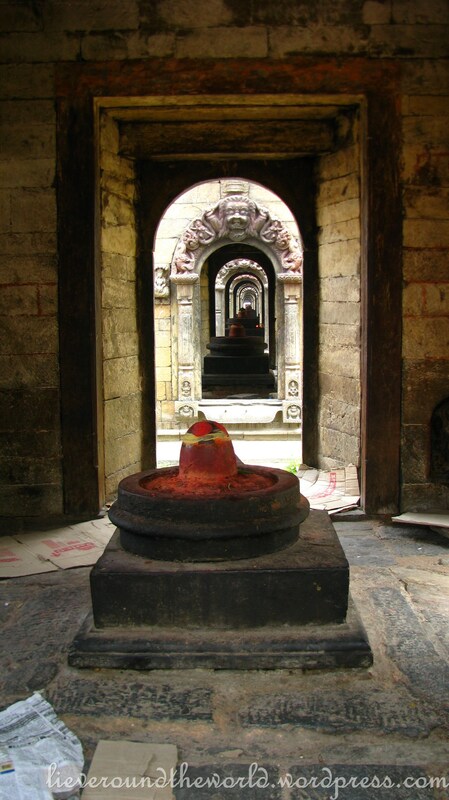 Having duly consulted the internet, on my return from Pokhara I asked Ashok to organise a taxi driver to take me to Pashupatinath, one of the most holy Hindu temples of Nepal, dedicated to the god Shiva. 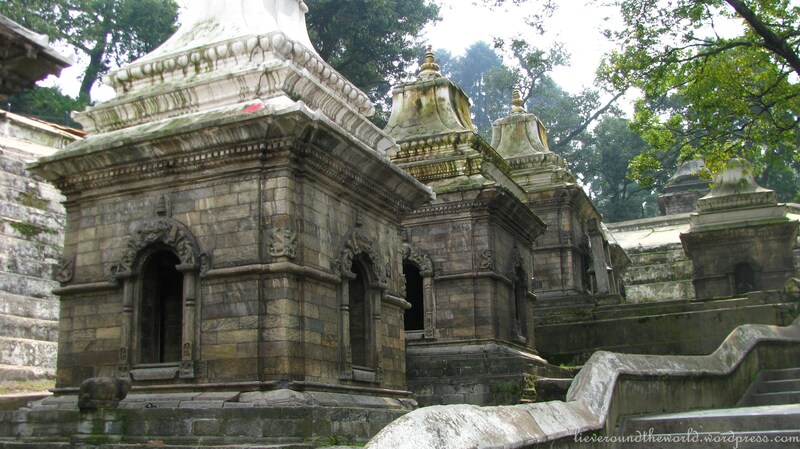 The ancient temple complex straddles both banks of the Bagmati River on the eastern outskirts of Kathmandu. 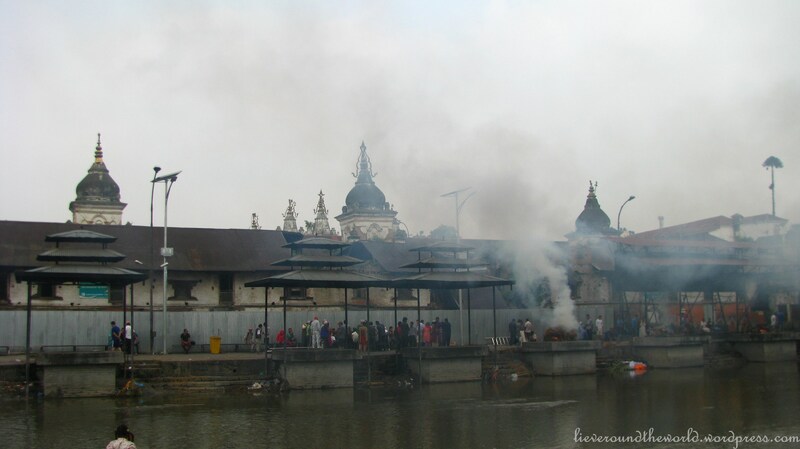 For centuries, this has been where many Nepalis faithful to Shiva have chosen to be cremated in the belief that they will be reborn as humans because any misdemeanours in their past life will just be brushed under the carpet. 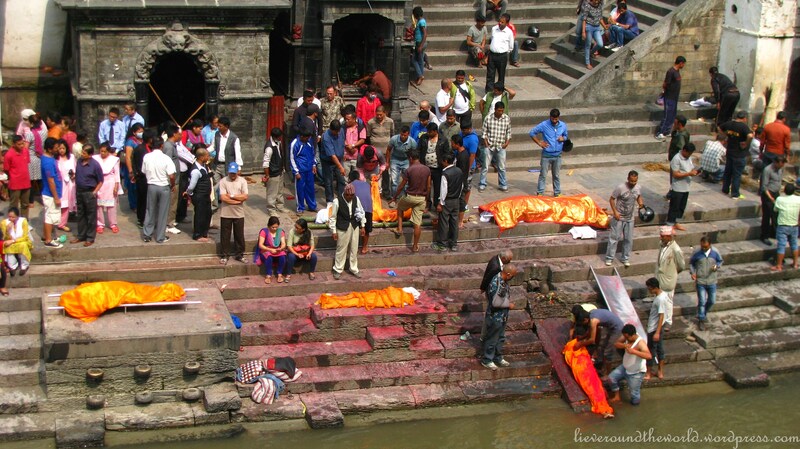 In the final weeks of their lives, those Nepalis travel to Pashupatinath to meet their death and, after cremation, to travel their last journey carried along the waters of the sacred river, which later joins the river Ganges. 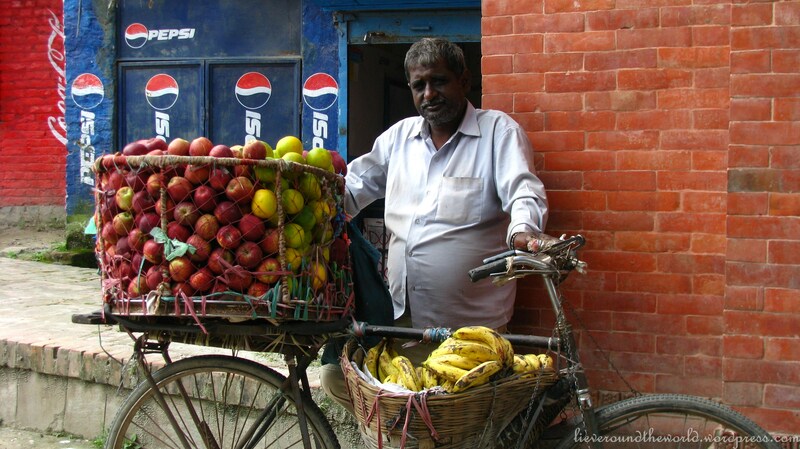 When I arrived, hawkers were in waiting, encouraging me to buy apples or bananas, or beaded necklaces and bracelet. 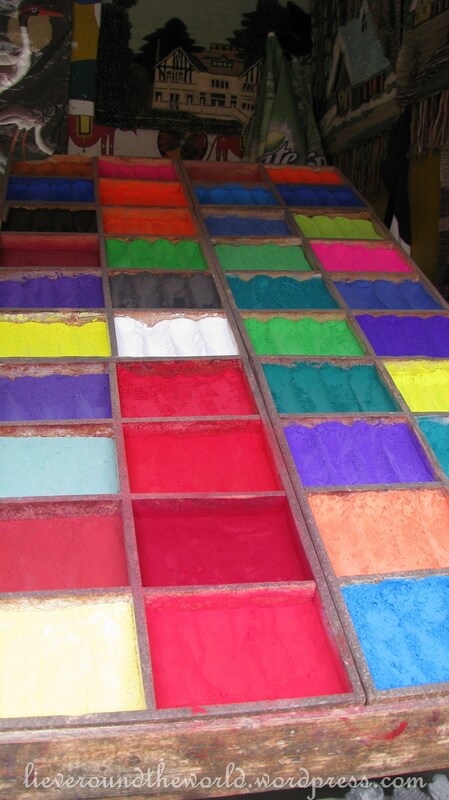 At the entrance a shopkeeper displayed a rainbow array of coloured tikka paints, the paints used by husbands and wives to put marks on each other’s forehead and the paint powders used in the festival of Holi, when no one can escape being covered in paint and paint powder. The PashupatinathTemple is also a magnet for Sadhus or Hindu Holy men from all over the Indian Subcontinent and my guide expertly guided me in the direction of their abode on some steps in front of ancient shrines where they pose for photographs with eager tourists, all for a fee of course. 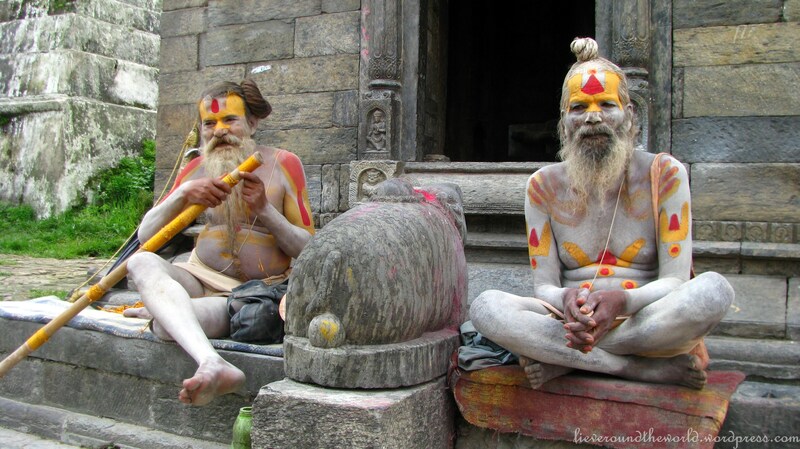 Clearly, I could not escape and had to take part in the photo session: various poses, various combinations with ashen grey men (covered in grey ashes from cremated bodies), brown men, naked men and barely clad men with unkempt hair and straggly beards. I allowed myself to be promised a long and happy life again (hence the red dot) for which I gave a generous (in my view….) donation. But then again, having made vows of celibacy and poverty, the Holy men depend on the charity of householders and tourists for their food whilst they spend their days meditating and contemplating in order to escape the cycle of death and rebirth. 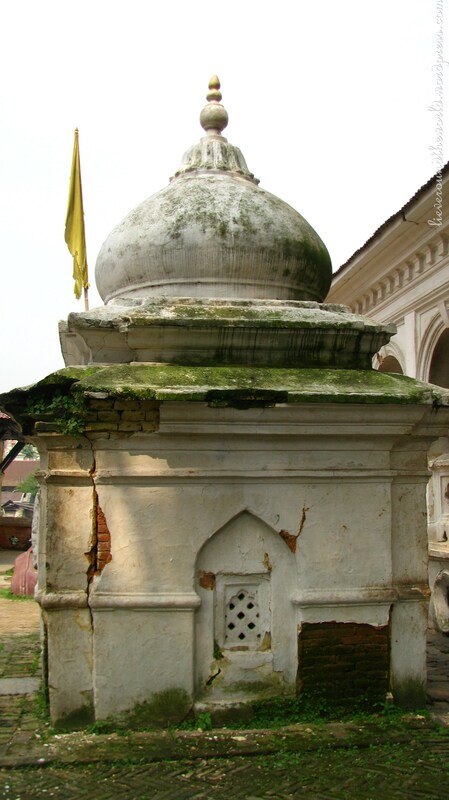 And to be fair, their ‘accommodation’ at Pashupatinath did not exactly shout ‘comfort’. 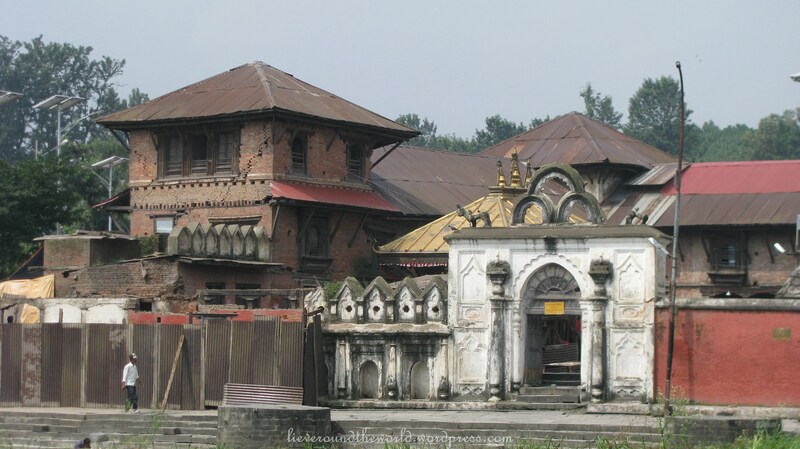 Just like many of the places I visited in and around Kathmandu, the area around Pashupatinath’s one main temple was jam-packed with smaller buildings and shrines, most of which withstood the powerful April earthquake and showed only minor damage. 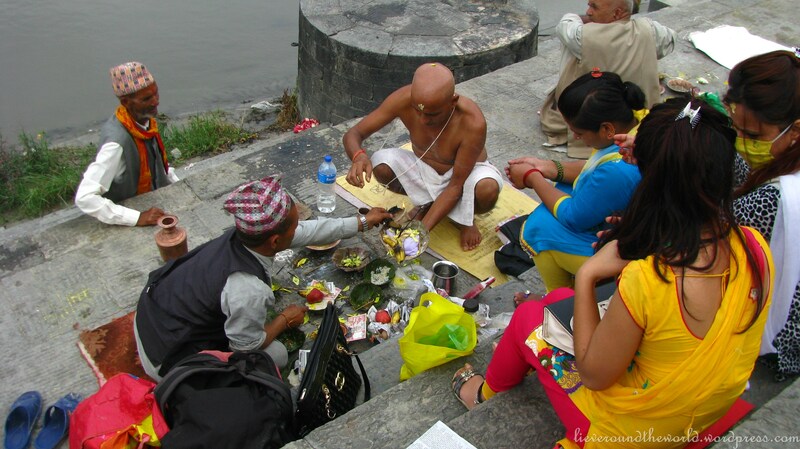 This entry was posted in adult gap year, Kathmandu, nepal, Pashupatinath on October 15, 2015 by lievelee. On The Trail of Sher Khan. 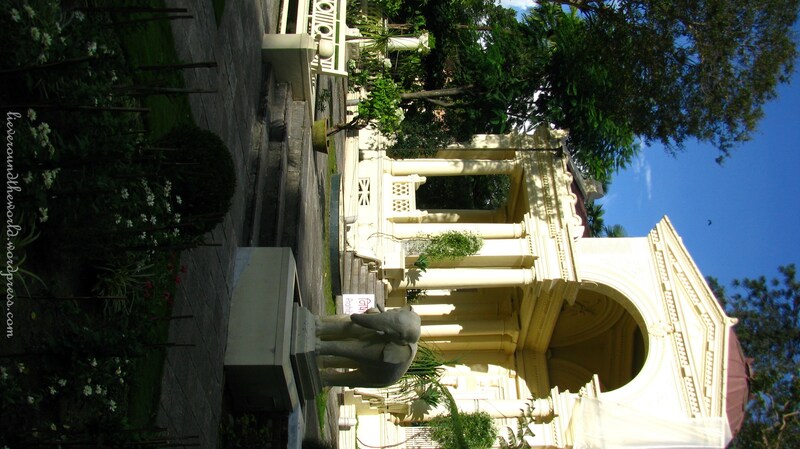 ‘This reminds me of Rudyard Kipling’s Jungle Book,’ Mike reminisces. And indeed, watching the convoy of elephants lumbering through the dense forest cloaked by early morning mist, you can almost hear Colonel Hathi’s Dawn Patrol or Elephant Song and imagine Mowgli following at the tail end… Mike is a retired history teacher, with a love of nature, wildlife and travelling, and we are sharing an elephant’s back on a trek through the jungle in Chitwan, Southern Nepal, on a quest to spot some grazing rhinos and the ever so elusive tiger. Of course, we are sure to see deer and hopefully some wild boar or mischievous monkeys, but to catch a glimpse of the evasive tiger would be a highlight of any trip. Mike takes out his camera to shoot a little video so his Facebook friends can get a flavour of riding through the jungle on an elephant. ‘I have tried out almost all possible modes of transport,’ he reveals, ‘and riding an elephant completes the list.’ He feels a little smug at his accomplishment, brushing away the invisible cobwebs hiding in the low-hanging branches which are slyly sneaking up on him. 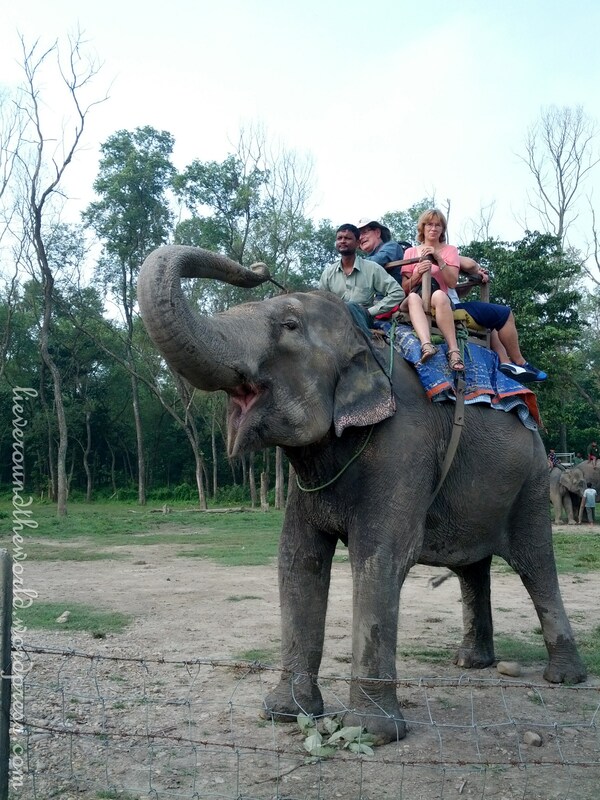 Although I would not consider being squashed in a wooden box with three other bottoms on top of an elephant a comfortable ride, it is a vast improvement on my last elephant adventure sitting astride a large pachyderm in Kerala – my legs took hours to get back into normal position. Trumpeting its loud protest, our elephant is cajoled and encouraged to wade through the crocodile infested river and into the darkness of the rain forest. 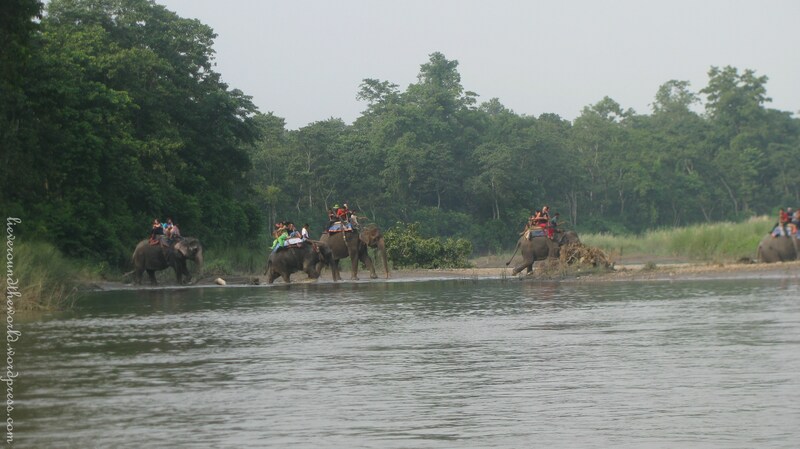 We hold on for dear life as with sudden speed and an unexpected spurt, it obliges the commands of the mahout. 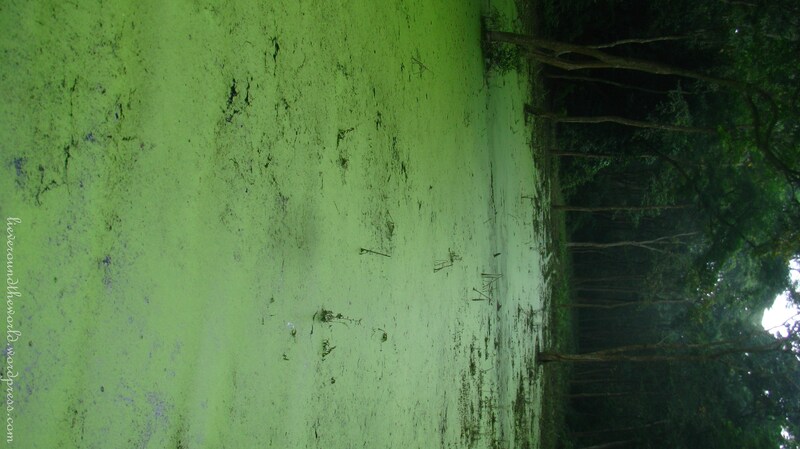 We hobble through the jungle, being jolted left and right, forward and back again, as the elephant squelches through the slippery paths, muddy and slick after the heavy monsoon rains, and plods through algae-covered slimy ponds. 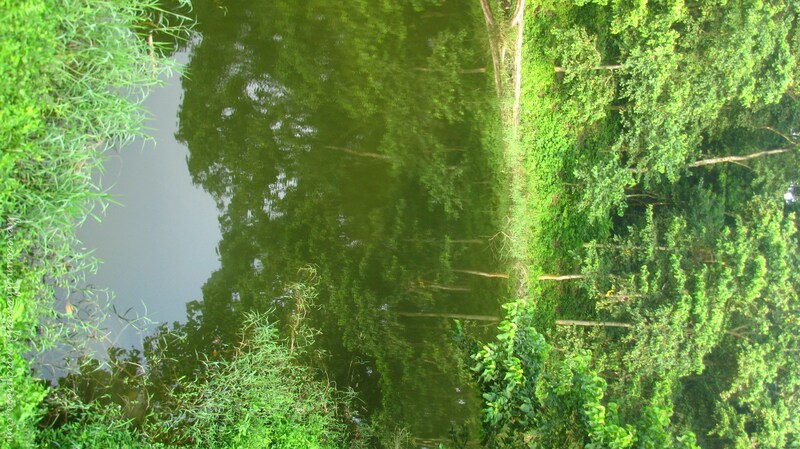 Sitting well above ground level, we scour the dense thicket for tell-tale movements in between the leaf cover and the mahout scans the forest floor for familiar paw and hoof prints. 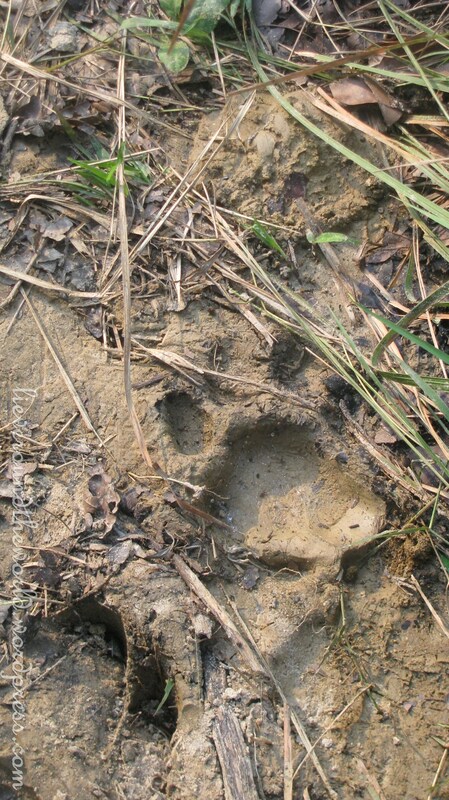 And there, just at the edge of the river, the mahout points out a tiger’s paw prints, fresh looking paw prints and a sure sign that a tiger is not far off. 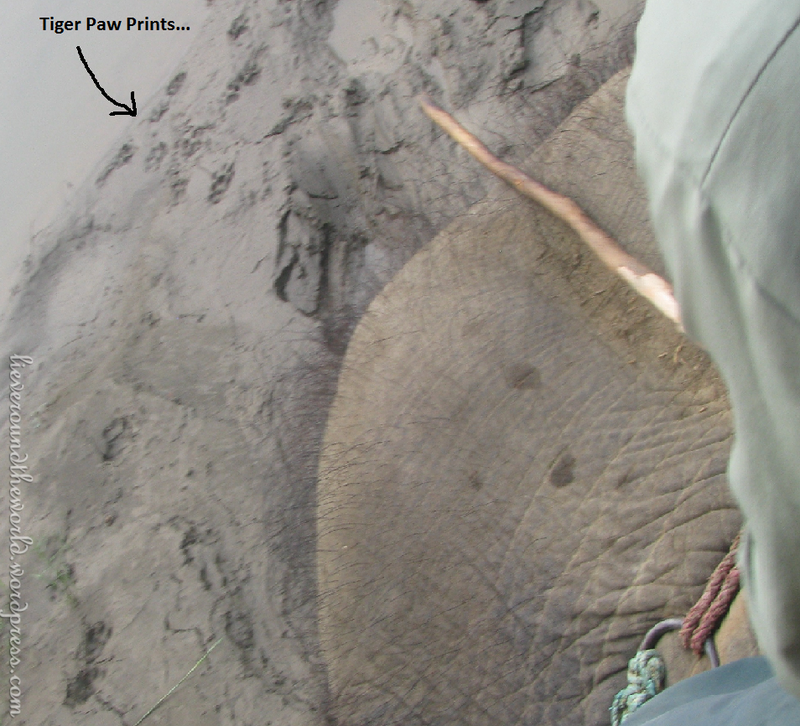 ‘These are not any tiger’s paw prints,’ the mahout explains in Nepalese. ‘These are the paw prints of the tiger that attacked and killed a local woman only last week. She was in the jungle collecting food for her livestock.’ Lucky for the two non-Nepalese speakers in the box, Mike and me, one of the other tourists is happy to translate. 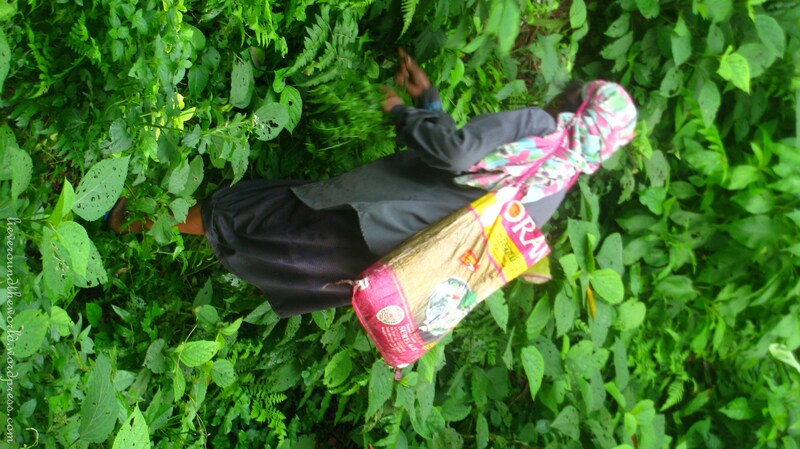 Even if the stories of a prowling tiger are true, the early morning bush is brimming with local Tharu women ignoring the dangers to forage for food and medicinal plants they can sell in the markets. They fill their enormous bags, fastened around the head, with heavy loads as they live in symbiosis with the jungle, the tiger their nemesis. However this is not the last time we are entertained with the killer tiger story, only there appears some disagreement about whether the victim was a woman gathering firewood or medicinal plants or a man doing a spot of fly fishing. And the timing seems a little vague: was it indeed only last week or did the fatal tiger encounter happen a few weeks ago? 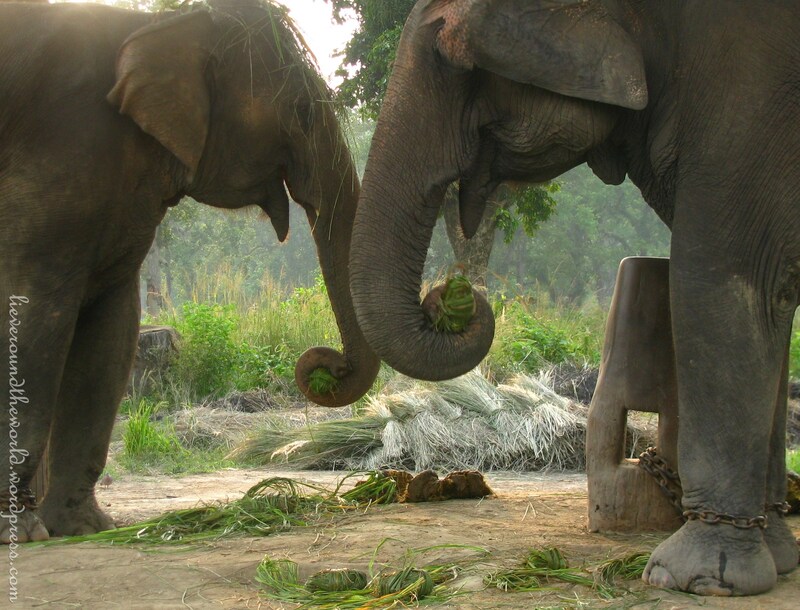 Do all visitors to Chitwan get fed similar stories? But recently a tigress with three cubs has been spotted in the area, a mother fiercely protective of her brood making her a dangerous animal to cross. 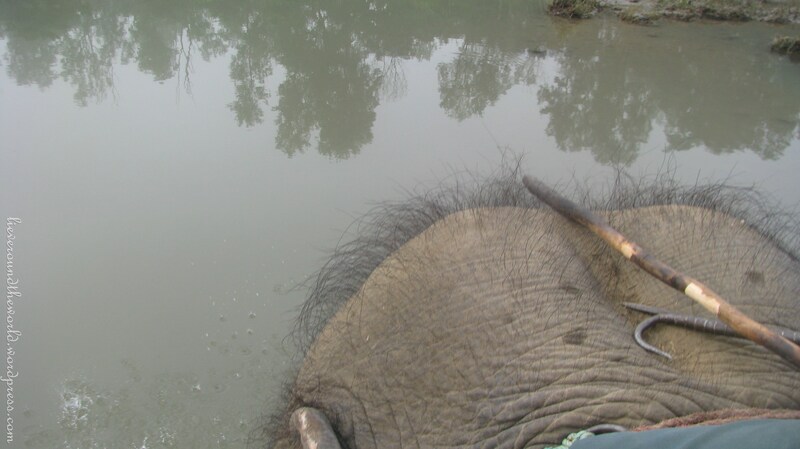 At least we are sitting high and dry on our elephant should the tiger make an appearance now… In the event, we see no tigers or rhinos, but are rewarded with sightings of deer and a lonely wild boar accompanied by the noisy twitter and tweets of the birds’ dawn chorus. In the afternoon, when the heat of the day has subsided, I continue my game watching with a guide and take to the river in a canoe hollowed out from a huge tree trunk. We look around expectantly for rhinos drinking lazily at the river banks after a day’s grazing. But only the crocodiles play ball, lurking just beneath the surface of the water, eyes unblinking, waiting for the right moment and the right prey. When we get out of the canoe to start our jungle walk, I keep an eye out for crocodiles sunning themselves on the sandy river banks, just in case. We trample through the soggy mire of the forest floor but only come across deserted termite mounds, a herd of fleeing deer and a camera-shy wild boar. 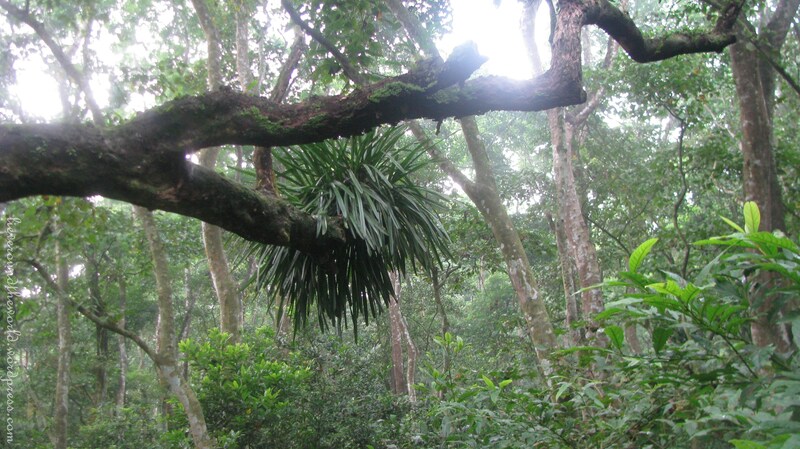 We admire parasite trees looping and snaking around twisted, gnarled tree trunks and watch huge orchid leaves on the branches, waiting to spring into bloom. Rhinos and wild elephants, we see none. 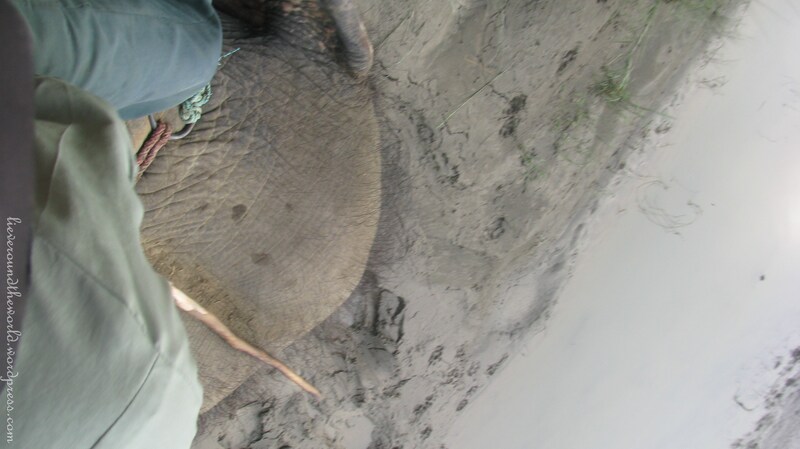 We make our way to the Elephant Breeding Centre when suddenly we spot another tiger paw print on the marshy path; I feel just a little on edge with this morning’s stories of Sher Khan still fresh on my mind and my guide just carrying a long stick for protection. But although plenty of evidence of tiger is abound, very few people have actually ever seen one and in his fourteen year long career in the jungle, my guide has tallied only about twenty sightings. 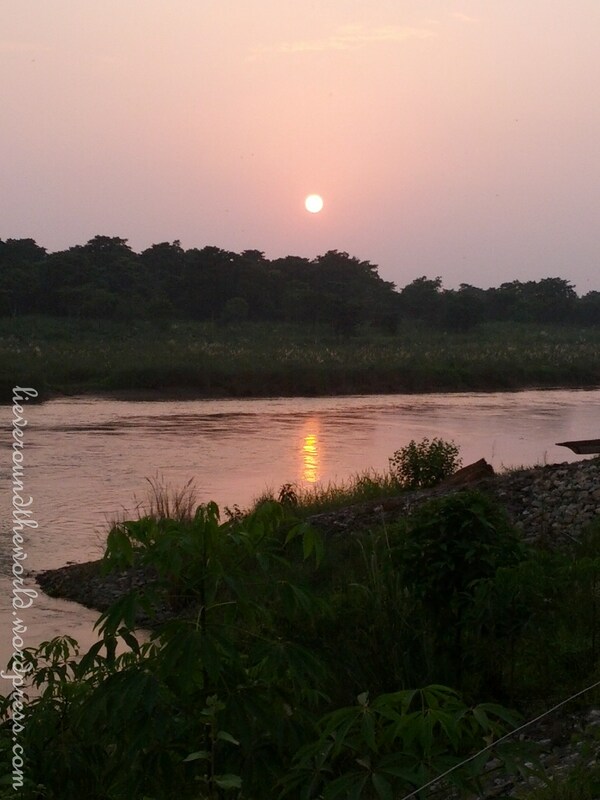 To complete my day’s ‘Jungle Book’ experience, I take up my guide’s offer of watching the sun set over the river. It was to have been the closure of my previous day, but then heavy, leaden rainclouds blocked out the sun and hampered any chance of a worthwhile sundown. Today we reach the spot just in time, together with a handful of other tourists who have come to delight in the spectacle and maybe a last glimpse of the wild animals that are drawn to the rivers and waterholes now that the air is cooler. 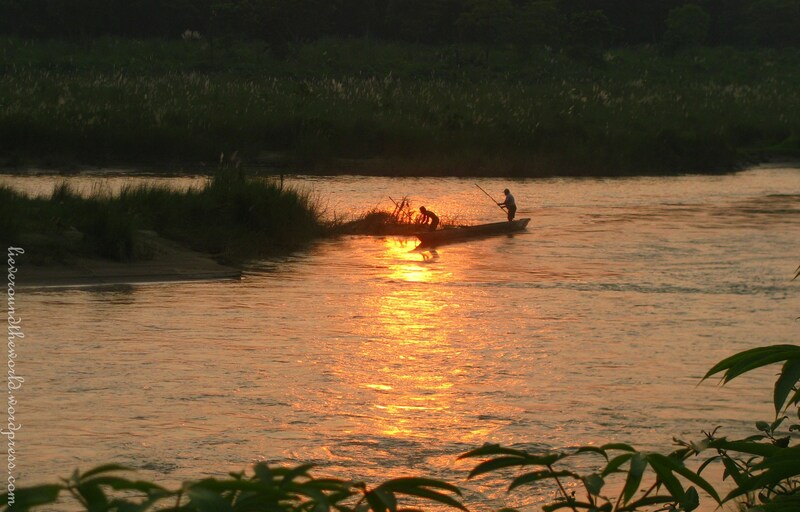 A lonely canoe traverses the river, cutting through the golden shadows on the water and the blood red river in the sun’s fading moments. And suddenly some commotion! 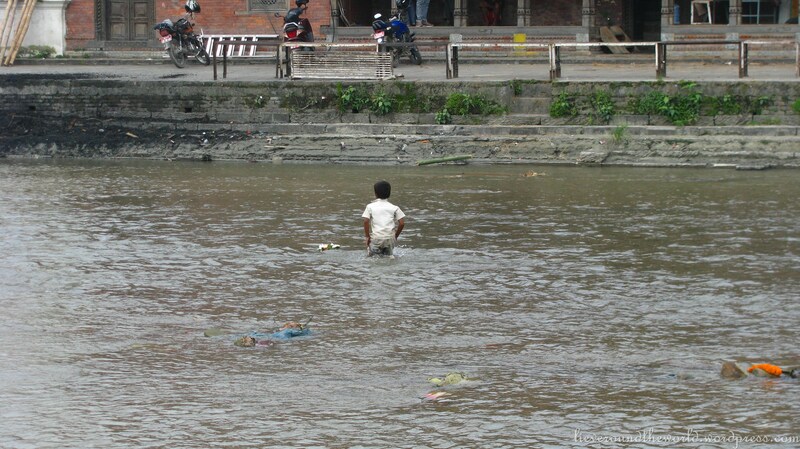 On the other side of the river, a creature crawls from the shallows of the water. ‘Is that a wild boar?’ a woman asks her guide, who quickly trains his binoculars into the direction of her pointing finger. ‘No, it’s a tiger!’ And as I am standing just next to her, I whip around to see the animal, but it is too far away to be sure. I grab my camera and take a photograph and then zoom in to expose the distinct features of a tiger. Having just pulled itself up from the murky brown river water, the tiger’s coat looks matted and bedraggled, its zoo-familiar stripy pattern concealed by the mud clinging to its body and paws. 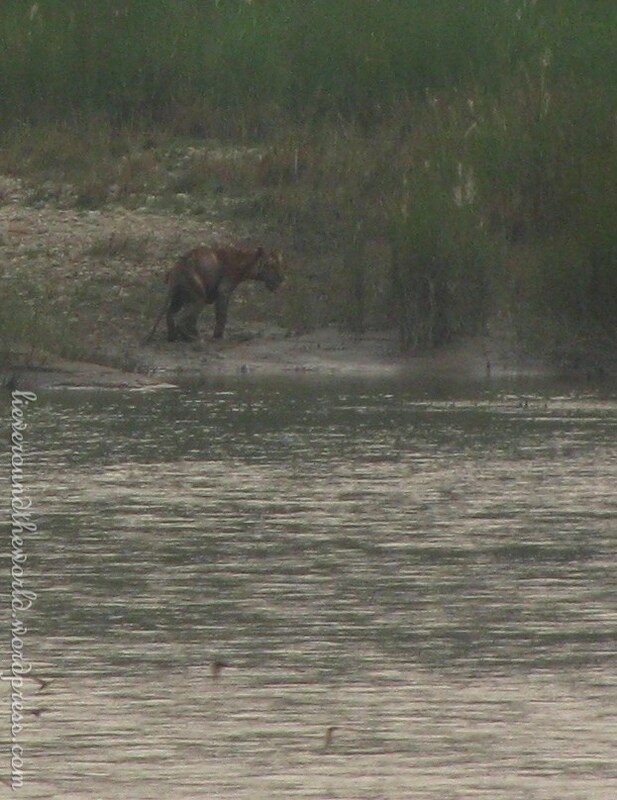 But its face leaves no doubt that it is a prime example of the Royal Bengal Tiger, a real Sher Khan, strutting across the riverbank I walked on just over an hour ago! And all I was worried about was sleepy crocodiles.. 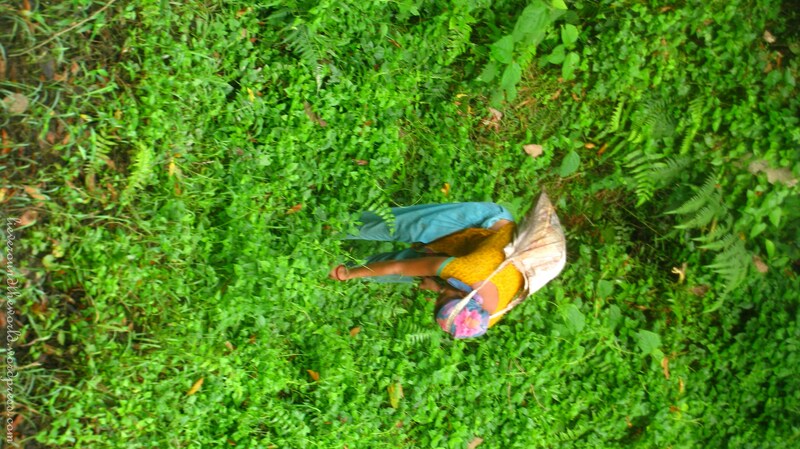 This entry was posted in adult gap year, nepal, tiger sightings travel, travel on October 12, 2015 by lievelee.